LOS ANGELES — The Vikings left the depths of the L.A. Memorial Coliseum with a mixture of emotions on Thursday night after a 38-31 loss to the Rams. There was some degree of satisfaction in the way players fought to go face-to-face and toe-to-toe with a talented Rams team that improved to 4-0 on the season. There also, however, is the reality of a 1-2-1 record through the first quarter of the season, a defense that has plummeted in the rankings after leading the league in 2017 and a pending Oct. 7 trip to Philadelphia on the backside of a long plane ride home and “mini-bye week” of sorts. Pregame question: How would the Vikings respond to laying an egg against the Bills? Failing to maintain home-field advantage against a heavy underdog was highly disappointing, but players vowed they would be ready to play Thursday, despite traveling two time zones on a short week. The Vikings offense quickly bounced back in Los Angeles from a terrible game Sunday against Buffalo, but the fight that Minnesota showed wasn’t enough for a win. Minnesota put together lengthy scoring drives early, going 13 plays for 75 yards in 7:05 on its first possession, and blending runs and passes to have better balance than against the Bills. The Vikings held the ball for more than 20 minutes in the first half, but the Rams still racked up 28 points by halftime thanks to a bevy of explosive plays against the Vikings defense. Four different Rams players had at least one reception of 36 or more yards, and Jared Goff had an NFL-max passer rating of 158.3 after completing 26 of 33 passes for 465 yards and five touchdowns, including a 70-yarder to Cooper Kupp that was part of a two-play drive. Minnesota had 20 points by intermission and trailed. The Vikings knew they’d have to make more plays in the second half and did. Stefon Diggs made an incredible pair of receptions on back-to-back plays. The first was on a pass deflected by Sam Shields for a gain of 24. Then he went way up after Kirk Cousins had to adjust his throw to get it over a blitzing safety. That catch was only 6 yards but quite impressive and preceded a 45-yard touchdown pass from Cousins to Adam Thielen. Thielen led the Vikings with 135 yards on eight receptions, and Diggs had 123 yards on 11 catches. 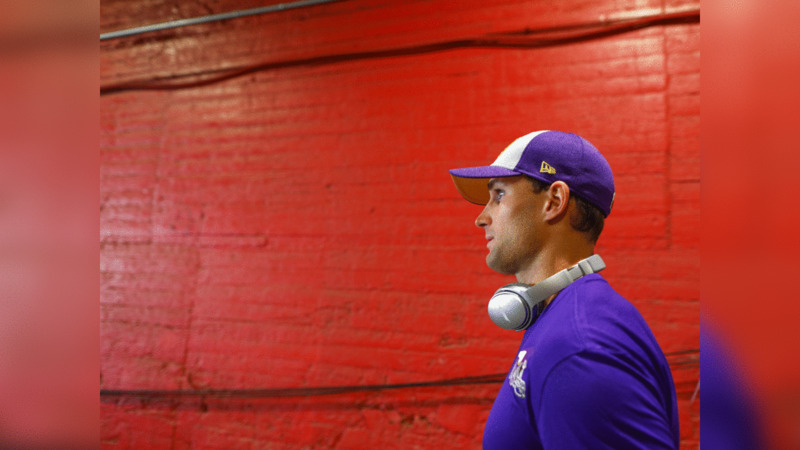 “That’s the only way I know to operate in this league,” Cousins said. “If you don’t bounce back, if you don’t have an answer, you won’t be in the league very long. So as much as we can say, ‘Hey, great job staying the course on the road, playing well,’ that’s the only option we have. That’s our only choice. Thielen had to leave the field against his will after his helmet collided with a defender’s leg during a tackle. On-field officials stopped play after the independent spotter requested that Thielen leave the field for an evaluation. The Vikings didn’t convert the ensuing third-down play, and the receiver was cleared to return to the game. “It’s a terrible feeling because I play with a lot of passion and energy,” Diggs said. “To lose is one thing, but to see guys go out there and fight, I watched my brothers give everything they had. Number 8 is a general, and we follow him. For the guys in the (receivers) room, we try to make all of the plays coming our way. That’s all. View images as the Vikings take on the Los Angeles Rams on Thursday Night Football.